So now I live in Oregon. No big surprise, except to my feet. I think I was California from birth. I've always preferred sandals, slip-ons, and open toes to anything. Now I live in a rainy state that makes all my cloth flats wet and cold (and non-sock friendly). And what else do I have to wear? Heel boots. No. Running shoes. They might be practical, but not cute. No. And I do not have rain boots. My solution was to buy this great pair of flat brown boots from Target, that were $10 off, and pair them with some skinny jeans. Fashionable and practical. Only problem, no skinny maternity jeans. This pregnancy I've had to purchase some new pants, mostly from a great consignment store "Back on the Rack" that's just down the street. So I have my old slightly larger maternity pants from before. I've made my own skinny jeans before. You can check out this post if you want to see. I followed the same idea, except I didn't previously have skinny prego jeans to copy. See below for method. 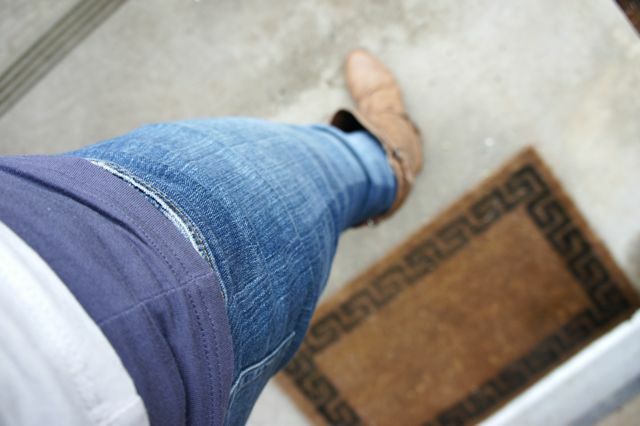 My solution (to aid you in your own alterations), was to put on my jeans inside-out. Just working on one side, I pinched the material on the outside of my jeans where it met my leg and I pinned it. I did this the entire length of my leg. Then I took off my jeans. Using a permanent marker I drew a line on my pants following the pins. (Then I could remove some pins and make sure I had my jeans flat). Then I sewed the line. You might not want to cut off excess fabric until a final fitting. Try on pants to check fit. To match the other leg (having the pants inside out again), I folded the finished leg on top of the unfinished and using my permanent marker, drew a line directly under my seam. Just lift the flap of extra fabric from the finished leg back a bit to match everything up. Sew. Turn right side out. Check for fit. Turn wrong side out (again), cut off excess fabric. Do not cut the elastic band on the top, just leave that tucked. So cute. Brilliant idea. Love the boots too.